No matter what size home you have, whether it is a house or apartment, there never seems to be enough closet space. Check out these closet organizing ideas to help you learn how to organize a closet. The first step to getting more out of your closets is getting more out of your closets. Going through each one in the house, sort things in four piles: keep, sell, donate and toss. You might surprise yourself in how much space you can find just by removing things you never use. Once you've sorted things into the piles, decide if there is a better place to store some of the items than in the closet. If you have seasonal or keepsake type things, consider putting them in plastic containers in the basement, attic or garage. That leaves the closets for things you need on a day-to-day basis. Now that you've sorted the things, you need to decide what will be stored in each closet. 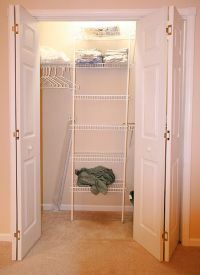 This will help you decide what type of closet storage system is best. You may need something different for each closet. There are closet organizer units you can purchase and install. There are even services that can help you chose and install the best system for your needs. One of the quickest, easiest and cheapest options is to get an adjustable bracket system. You hang the metal rods with slots on the sides of the closet. Then simply place the support brackets where you want shelves. Wood shelves are easy to cut to size. Many home improvement and lumberyards will cut the pieces to size for you. Sometimes they may charge a fee. The shelves can be sanded, painted or stained and you are ready to start organizing the closets. There are plastic shelving units that snap together which can be placed inside the closet. They aren't as adjustable, but they are sturdy and take no tools to put together. These closet storage systems also come in a variety of colors - some specifically designed to be used in children's rooms. If you prefer a more permanent closet storage solution, there are organization units that can be built right into the closet. They combine clothes rods, shelves, drawers, boxes and baskets. There are do-it-yourself options as well as companies that will come in and help you put together the perfect system for your home. Regardless of which kind of closet storage you chose, it will take a bit of time and effort to get your closets organized and maximize your storage space. But, it is well worth it in the long run. These closet organizing ideas will help you get started! 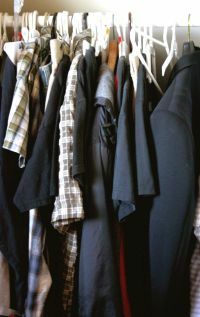 Return Closet Organizing Ideas to Home Organize It!